Why should you accept being tethered to a desktop computer when managing your art collection? When working with your art, you’re on the go—whether it's walking through campus or terminals, main streets or hotel floors. Your objects move from storage facilities to galleries, from one office to another or traveling across borders for loans and exhibitions, and you need to be able to track these artworks from anywhere. You need a collections management system that’s as mobile as you are. That’s why collectors and institutions are moving to cloud-based professional art management systems. Gone are the days of being dependent on a PC. Now there is software that can be used on Apple iPads, Microsoft Surface tablets, smartphones and Mac computers. You can access your collection documentation anywhere, switching between your tablet and desktop computer, giving you the mobility you need without sacrificing your access to information. Here are ten ways that caring for your artwork on the go is easy with Artwork Archive. Photograph your works and instantly upload them to your account. If you’re just beginning the process of archiving your collection or documenting a new purchase, it’s easy to photograph the work with your mobile device, upload the image directly into your database, and then annotate and save any important information at the time. All you need is an internet or data connection. Artwork Archive’s batch uploader allows you to upload 20 works at a time so that you can quickly create object records. Save time searching for artworks. Quickly direct yourself or others to an artwork's location. Headed to the storage facility and forgot where a piece is located in the numerous drawers? Sending a staff member out to assess a public art piece in town or in a ten-story hospital? Take the second-guessing and scavenger hunting out of collection management. Always know where your works are located. With a mobile database, you can pull up a piece’s location record right when you’re there and make any needed edits. Track important conservation notes immediately. And when you’re out and about, you can quickly note important information. No more remembering until you get back to your computer. Or worse, forgetting. If you send volunteers out to assess works in the collection or are doing it yourself, everyone has access to make notes of the works’ status. And those details can be instantly shared. Create a maintenance report in a few clicks of a button. Then, send the reports straight to stakeholders from your account. Lauren Lockhart, San Diego International Airport’s art manager explains how helpful Artwork Archive’s Maintenance Record feature is to her collection management. Get reminders on the go. Set it so you can forget it. Set reminders for yourself and your teammates. Simply enter the date, write a quick message, and then sync it to your calendar so you can stay on top of it. Artwork Archive will even send you an optional email every Monday with your upcoming week’s tasks. Send important assets and reports while you’re out. Chances are, you have a network associated with your collection whether that’s familial, legal, financial, curatorial, etc. With a click of a button, you can share information right from your account. It's even easier if these people are saved to your contacts. Traveling with your collection? Organizing a consignment with a gallery? Coordinating a loan on the road? You can quickly create and send inventory lists, tear sheets, insurance reports, portfolio pages and more. Learn more about Artwork Archive's reports. Share information with your team. An informed team is a successful team. Some collection management systems require you to pay for licenses for each computer on which the program is downloaded. This means that the staff becomes dependent on just one colleague to get information or receive a report. With a cloud-based solution like Artwork Archive, team members can access a shared account from anywhere, even at the same time. And, you don’t have to empty your wallet to pay for that flexibility. Additional users are included in monthly plans that start at $24 a month. See Artwork Archives's plans here. Have contacts on hand, from anywhere. If you meet an artist at an art fair or are given the name of an appraiser while away from your desk, don’t worry about losing that contact. Add their contact information into your Artwork Archive account so you always have it at the ready. Out assessing a piece of art and need to connect with your conservator? Quicky pull up their phone number to give them a call. Or, send them your completed maintenance record from the field. Contact management from your mobile device is no longer a nice-to-have, but rather an expected tool. Have curious art lovers eager to see works in your collection? Use Artwork Archive’s slideshow view to pull up your art objects. You don't have to spend time searching through desktop folders or worse, manila folders, waste hours creating Powerpoints or Keynotes. With Artwork Archive's professional presentation tools you’ll have all of the information and images at your fingertips when presenting to stakeholders—executives, board members, city council, etc. Gain peace of mind with enterprise security. Cloud-based doesn’t mean risky. In our increasingly mobile society, everything is online. Shouldn't your collection tools be as well? Step away from your computer and sign up for Artwork Archive. 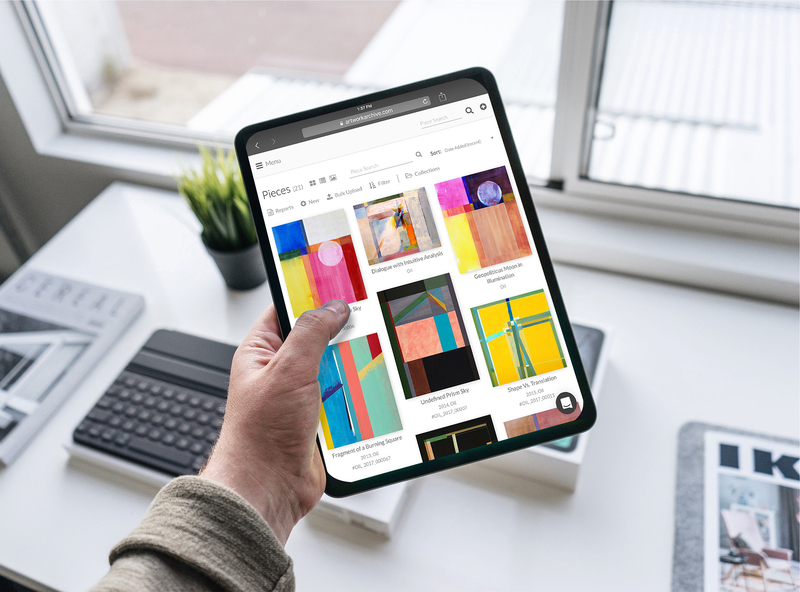 You’ll see how simple it is to manage your art collection online.